I woke up Sunday morning after a pretty good night's sleep, not feeling too bad. I guess going two full days without any sleep kind of forced my body into the local time zone. I doubted the rest of the week would be so easy, but I was feeling pretty good on Sunday morning. My co-workers Craig and Melinda had arrived early on Sunday morning, and I wasn't expecting to see them until later in the day. To my surprise, I ended up running into them at breakfast - I guess they couldn't sleep. After breakfast we headed down to check out the conference area, and were pleasantly surprised to find that our booth was being assembled for us, so there was nothing for us to do. On that note we decided to hire a driver for the day, and check out a bit of the countryside. 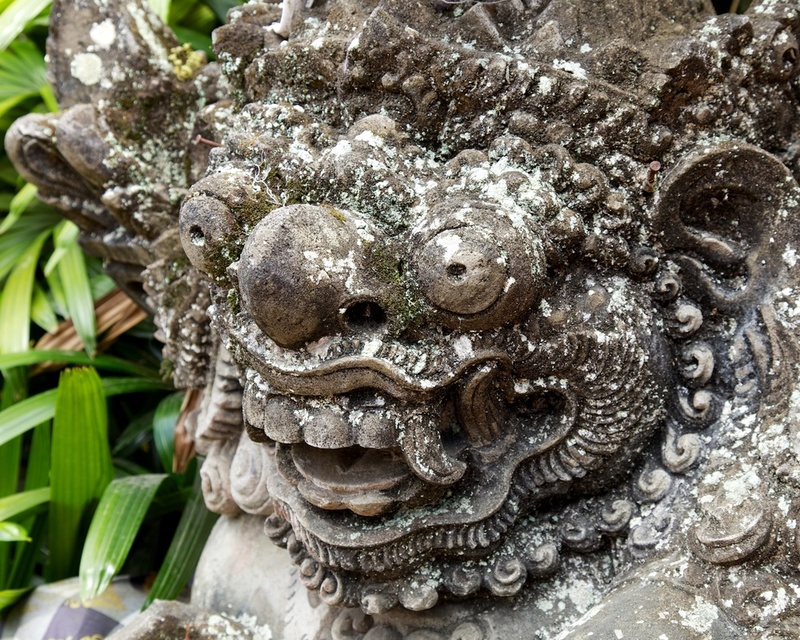 The Balinese like their statues. They are everywhere around the country, and are pretty cool looking. We decided to check out a couple of the local hotspots further north in the country. I had been reading a guide book on the way to Bali, and had noted a few things I wanted to check out. 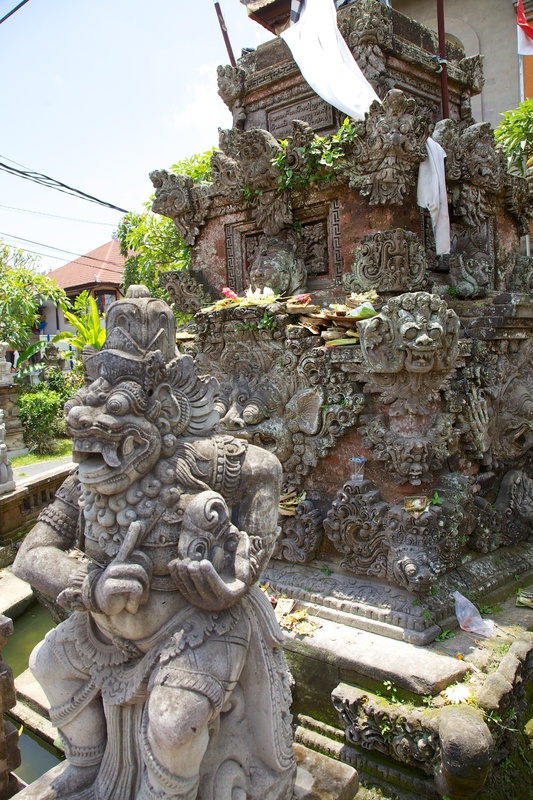 Our first stop was the market town of Ubud, which was supposed to have an interesting craft market. It is located about an hour or hour and a half north of where we were in Kuta. The drive wasn't that interesting, other than to see a little more of the "normal" city life in Bali. The market was a big disappointment frankly. There was nothing really unique or interesting, just a lot of mass-produced crap for the tourist trade. We did walk around a bit, and check out a few of the local temples, which were much more interesting. Everyone was preparing for some big festival, so the temples were a beehive of activity. 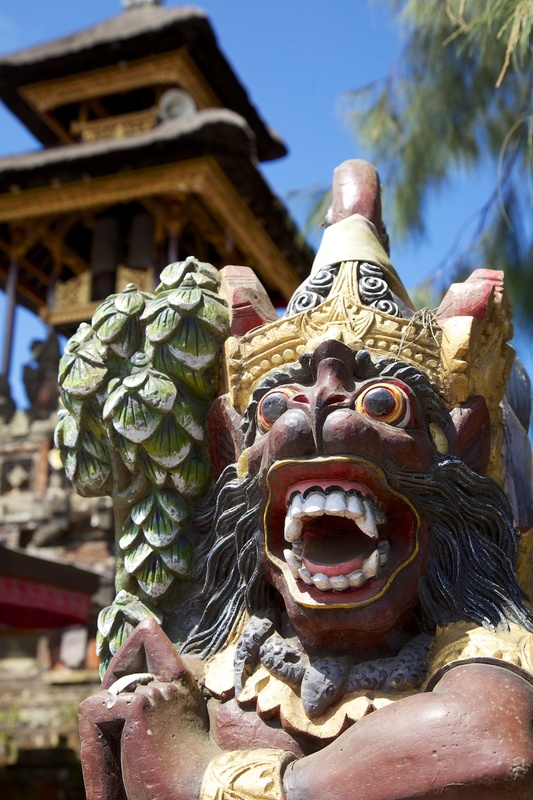 The temples around Bali are very cool. I don't think that most of them are very old, but they are very ornate. After getting our fill of Ubud, we headed north further, towards Mount Batur, the second biggest volcano/mountain on the island. One of the things I really wanted to see in Bali was rice paddies, and so we asked the driver if there was a place we could see them. I was hoping for an authentic, small "farm" or the equivalent, but not surprising, we got taken to the tourist equivalent. I think it is a real, working rice farm, and it was beautiful, but ti still felt like it was there to cater to tourists. Probably the single most beautiful location we saw in Bali. While a total tourist trap, the rice terraces are very cool, and just something you don't see in our part of the world. We probably spent a good hour or two wandering around the area near the rice paddies. It was just so cool, and so different. I was glad we stopped to have a look. It seemed like you could walk down and around them, but none of us really had the desire to do so, so we stayed at the top and just enjoyed the view. Palm trees and rice paddies in Balli. A totally different world. 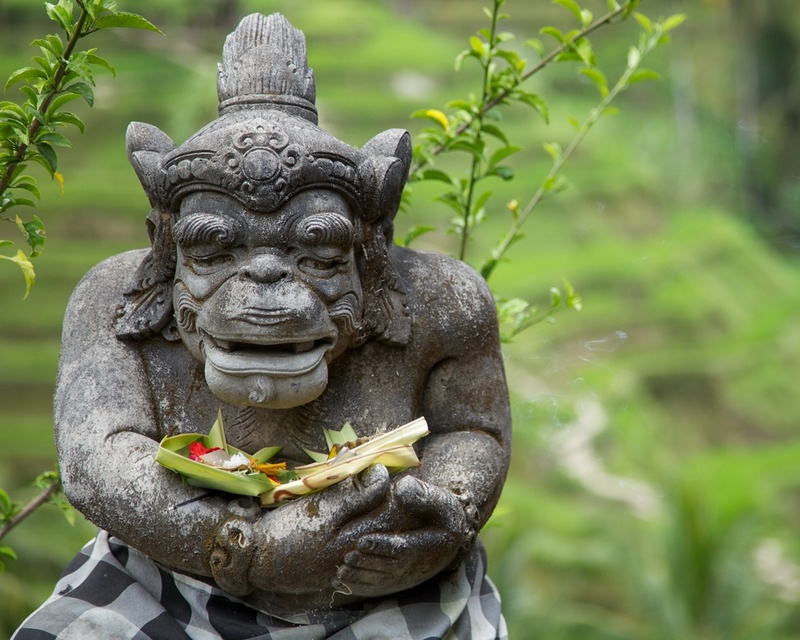 As I said, the statues and offerings were everywhere around Bali. 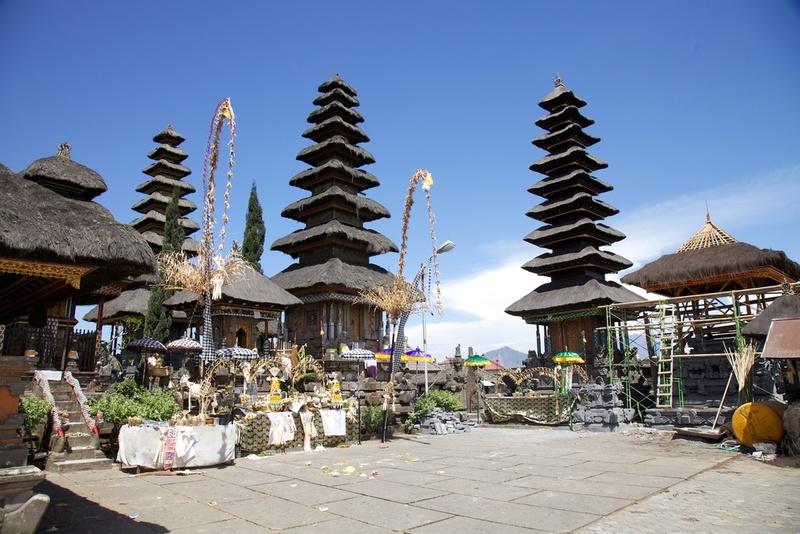 After the ride paddies, we continue north towards Kintamani and the temple I wanted to visit. As we were making our way through the rural areas, we came across another smaller temple that was just finishing up some festivities. 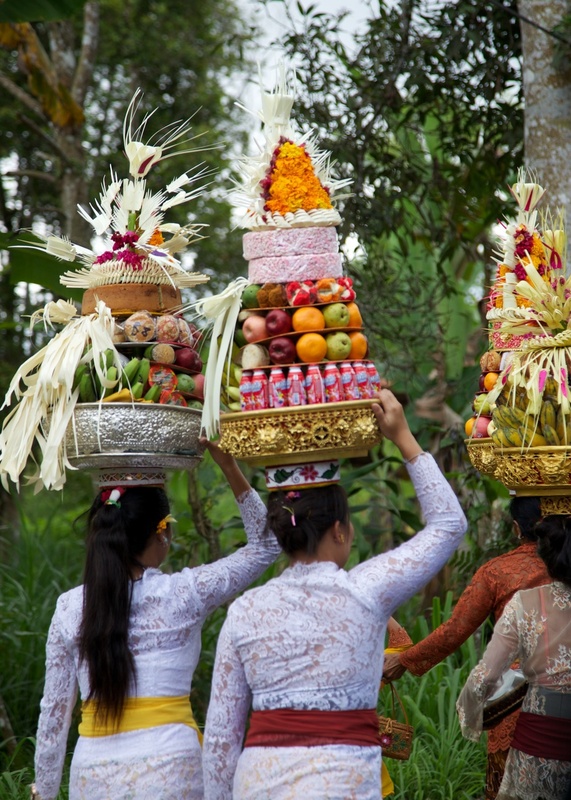 People were pouring out onto the streets, all dressed in formal cloths, with the women all carrying these crazy displays on their heads. It was pretty cool to see. People streaming out of the temple, during a festival. It's amazing what these women are able to carry on their heads. Throughout the trip I was amazed by what I saw. After another hour or so, we had worked our way up into the mountains a little bit, and got to the temple of Pura Ulundanu Batur, near Mount Batur. This was supposedly the second largest temple in Bali, and was unique in the the huge temple grounds were shared by Hindu and Buddhists. They shared the temple 50/50, and an impressive temple it is. 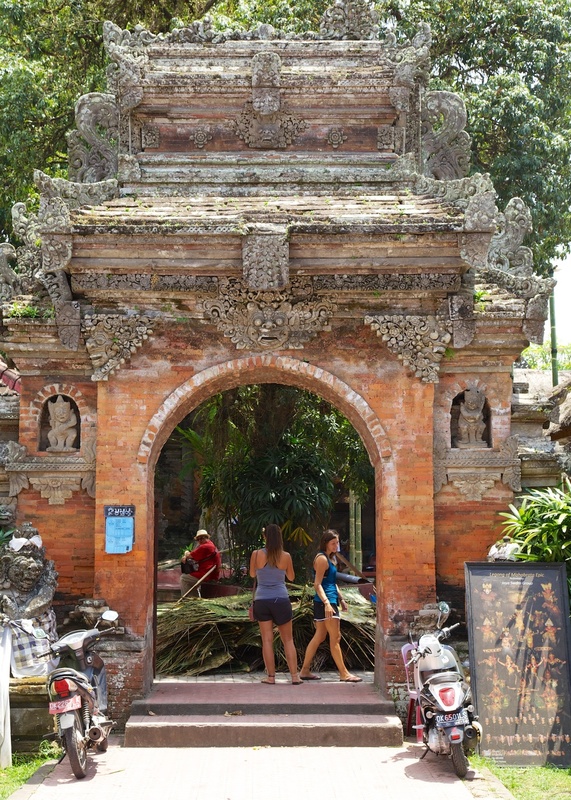 One of the entrances to Pura Ulundanu Batur. Our visit didn't start very well. After paying our entrance fee, we were taken into this building where, most conveniently, we were told that we needed to have a sarong in order to enter the temple. Yes, after we paid. And of course there was a woman there that would happily sell us a sarong for US$50! Needless to say we were not very impressed. After much negotiating, and attempts to walk away (I didn't need to see the temple that badly), we got it down to US$10. One of the crazy/amazing statues around the temple. 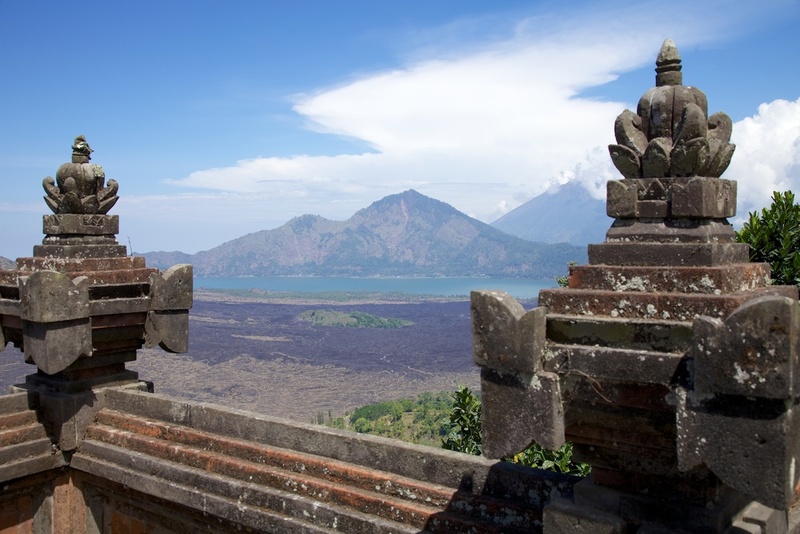 Mount Batur and Lake Batur from the temple. The volcano and the lake provide a stunning backdrop, especially on a clear, blue day. I'm not sure how long it was that we spent in the temple, but it was quite a while. By that point we were pretty wiped, and we had about a three hour drive back to the hotel. I think all three of us ended up asleep in the car on the way back. The next two days were all work and no play. The conference started on Monday morning, and ran Monday Tuesday, broke for a local holiday on Wednesday, then resumed on Thursday. I gave a couple of presentations on the first two days, and spent a lot of time in our booth. Which was outside. In 30+C heat with close to 100% humidity. It just about killed me. But we fought through, and had some good meals in the evenings.